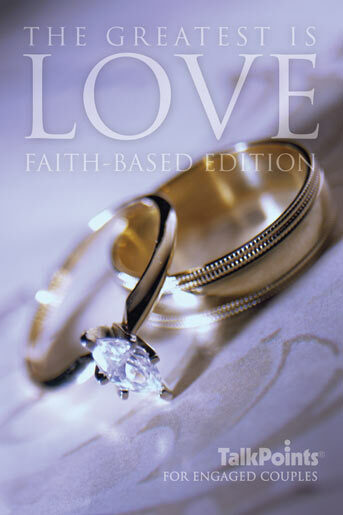 In this sequel to the original book, The Greatest Is Love, Dr. Nelson integrates a theology of marriage based on Protestant theology with scriptures, guided prayers and silent prayer as a part of each introduction to the ten conversations. NEW! You can now refer couples (anywhere in the world) to an online marriage preparation class. Three classes are offered: the Basic eCourse, the Christian (Non-Denominational) eCourse, and the Roman Catholic eCourse. To learn more about how to integrate this innovative approach into your ministry with engaged couples, go to www.OnlineMarriagePreparation.com or contact TalkPoints directly. Communication and faith in a couple’s lives were something this book emphasized and that above all else, with a strong faith foundation, problems/issues don’t have to remain unresolved. 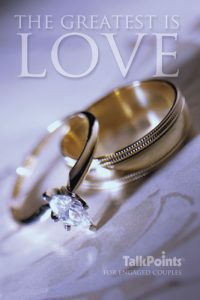 I would certainly recommend this book to anybody – married, engaged or otherwise. This book really helped to open the lines of communication for us. We needed to discuss these topics, and I am very glad we were able to do this before our wedding day. I found the conversations to be really helpful. I enjoyed the conversations and the opportunity to get some of the hard conversations started. It gave us the intimate, one-on-one, non-distracted time we needed to talk about these topics. I thought this book was very helpful giving us a chance to talk about different issues. The material was beneficial and easy to follow. I would definitely recommend it. The most helpful part of this course was the opportunity it provided for real dialog. I appreciated the time that this created for us to focus on one another. It gave us a chance to really examine some key areas that will benefit our relationship and marriage. The most helpful for me was having specific conversations around guided questions. We found the conversations very helpful and they really opened up our thoughts/ideas to each other. I feel that we will be more comfortable talking about things.